Yes, we do eat vegetables in our home. Lots and lots of them, prepared all kinds of ways that are so good they can be a main dish or a side dish. Like this recipe– Stir-Fried Cabbage with Bacon, when you’re at the end of the monthly food budget but still want to eat well. And just in case you need a reason to buy bacon on sale and keep it in the freezer. Cut the bacon into ½- inch strips. Cook slowly in a large pot over low heat until the strips are cooked but not crisp. Add the garlic and onion to the bacon and sauté in the bacon grease. After a few minutes add the grated carrot and stir slightly. Add the sliced, chopped cabbage to the pot. 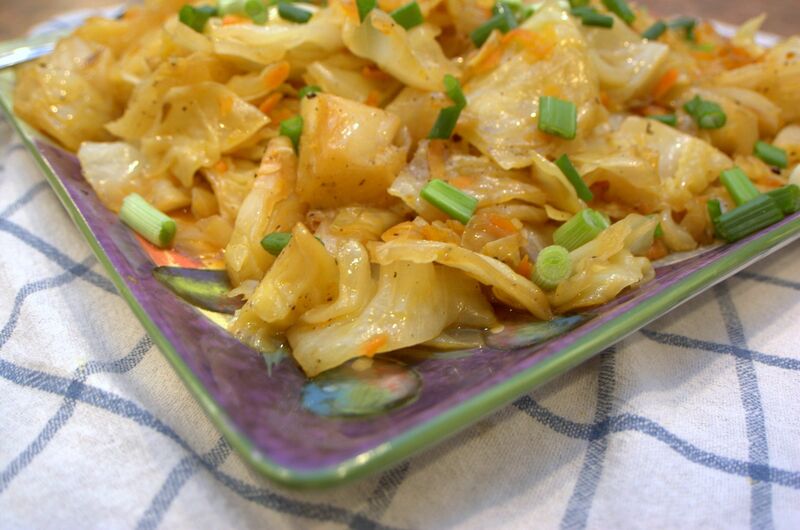 Stir, cover and simmer over low heat until cabbage is completely wilted. Add salt and pepper to taste, garnish with chopped green onions, and serve. Serving suggestion: As a main meal, serve with Steamed White Rice and Nutty Muffins.